I recently started getting a weekly delivery of fresh fish from my local fish market. I like supporting local stores, and since they have some fresh wild fish options, I decided to give it a try. It tends to arrive at my door around 5 pm, which is perfect timing for me. It’s right around the time I get home and just in time for me to prepare dinner for the family. I recently got some amazing fresh wild salmon to cook for dinner. We eat salmon often in our home. It’s a reliable fish that’s easy to cook and loved by all members of the family – even the kids. I was very pleased with the quality of the fish when it arrived and I really wanted to showcase it. I love searing the salmon so that the skin gets crispy. I sometimes save the skin for making crispy salmon skin sushi rolls. But this night, I served the salmon with the skin on. Why not? It’s delicious! I washed the salmon well and then dried all sides with paper towels. I cut the salmon in to serving size pieces and then sprinkled both sides with salt and pepper. I mixed up my miso glaze. It’s a combination of miso, tamari, sriracha, ginger, garlic, sesame oil, and brown sugar. 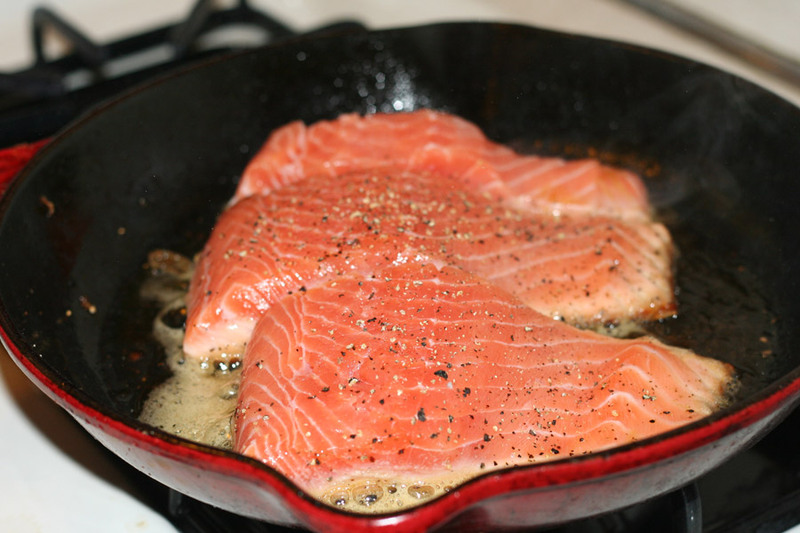 I seared my salmon, skin side down, in my cast iron skillet. While the skin side cooked, I brushed the salmon flesh with the miso glaze. After a few minutes, I carefully flipped over my salmon pieces. I let the glazed side cook. I let it cook for another few minutes. You don’t want the salmon to get overcooked. It should be just cooked before removing it from the heat since it will continue to cook for a bit. 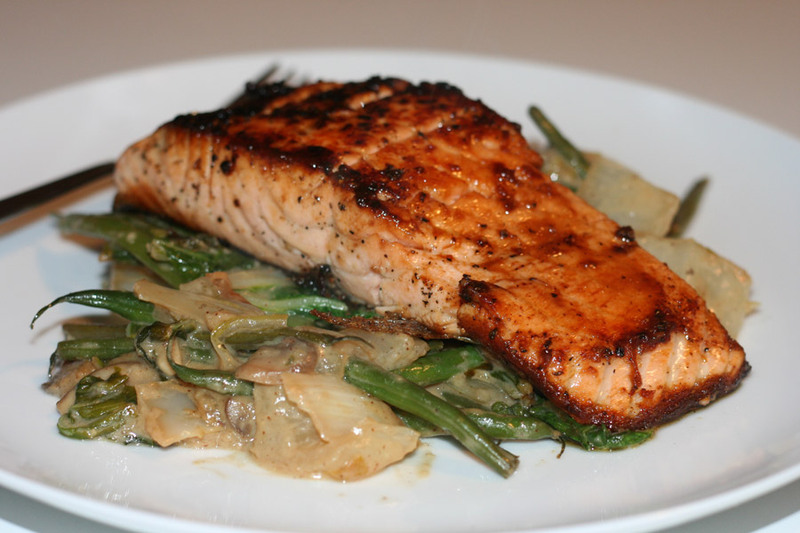 I served my salmon over a bed of stir-fried haricot vert and bok choy. Dinner was cooked in less than 20 minutes and it was so easy! 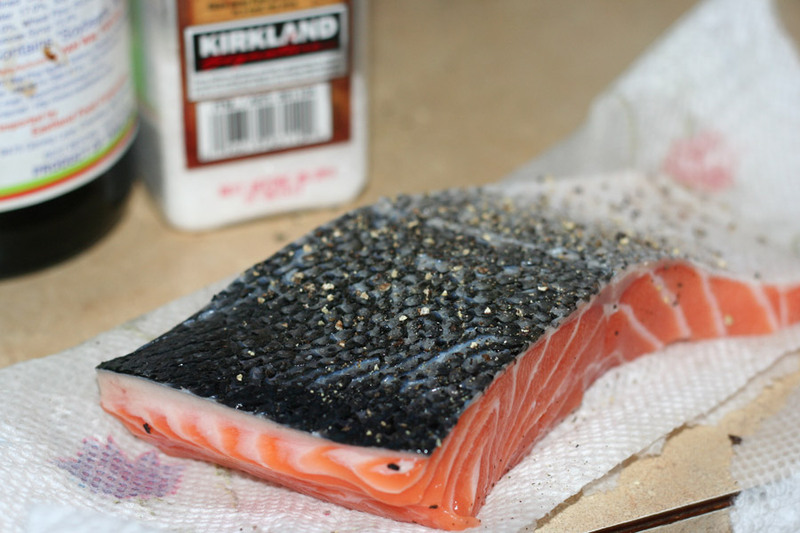 Wash your salmon and dry with a paper towel. In a small bowl, mix up the miso, brown sugar, ginger, garlic, tamari and sriracha. Heat up a large skillet on medium-high heat. Add in the oil. When the oil is hot add the salmon, skin-side down. 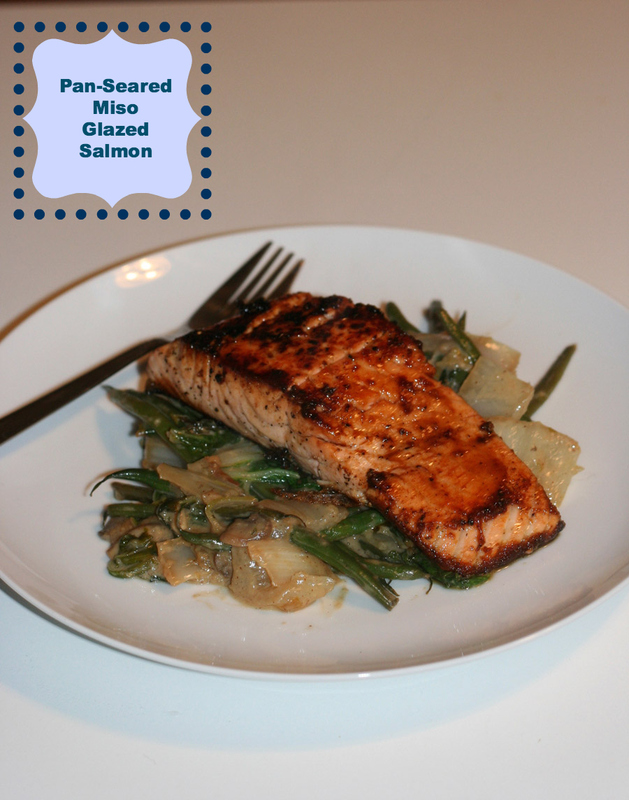 While the salmon cooks, brush the miso glaze over the salmon. Cook the salmon on each side for about 4 minutes. Carefully flip over. After around 4 minutes on each side, the salmon will just be cooked through. Do not overcook. Serve with your favorite stir-fried vegetables, rice or other side dish.